Lt. John P. Burns and the Curtiss P-40 Warhawk that he used when he died. 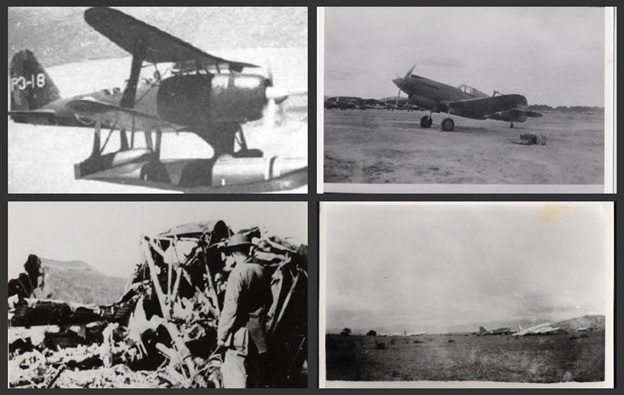 Lt. Burns was a fighter pilot with the 21st pursuit squadron based in Del Monte, Bukidnon. The events of his life in Mindanao were recorded by Lt. Burns, written in a leather bound diary. How the diary ended up in the hands of the Burns family turned out to be a story in itself. John Patterson Burns was born on September 22, 1917, in Mansfield, Ohio, and graduated from Uniontown High School in 1936. In June 1940, he graduated from Ohio University with a degree in electrical engineering and a commission in the Infantry of the Army Reserve. Burns received his wings from Kelly Field on February 7, 1941, in the class of 41A, fulfilling a childhood ambition. He was subsequently assigned to the 21st Pursuit Squadron of the 35th Pursuit Group at Hamilton Field, California, where he served until his squadron and the sister 34th Pursuit Squadron were ordered in October 1941 to “PLUM”, the code name for the Philippines. Nichols Field was just south of Manila, where the 17th Pursuit was currently based. Because the movement of American pilots from the US to the Philippines was “top secret” evidently the 21st and 34th Pursuit pilots still thought that PLUM was a base in the Philippines to which they were being assigned. Maj. Gen. Brereton had issued an order putting the FEAF on a “readiness” alert. The pursuit pilots including the 21st and the 17th at Nichols Field–were put on one hour’s notice to take off in their combat-loaded P-40Es and intercept in the event of a Japanese attack. The Japanese has not yet invaded Mindanao; it has been barely a month since four stars general Douglas MacArthur took a ride on a B-17 bomber to Australia. At about 5:00 that afternoon, the personnel at the Del Monte Field were startled when three B-17s and 10 twin engine bombers (B-25’s) of a type they had never seen before approached the field and came in to land. Headed by Maj. Gen. Ralph Royce, they were on a special mission from Australia to raid targets on Cebu (central Philippines), Mindanao, and (for the B-17s) Luzon. The pursuit pilots were to provide support for their operations. 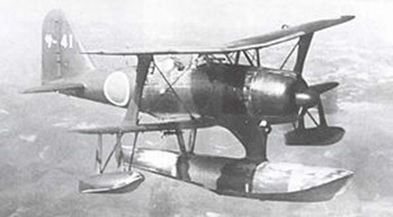 Japanese floatplanes–Mitsubishi “Pete”-operating in pairs appeared over Del Monte field in the early morning and made unsuccessful bombing attempts on the three B-17s on the ground. The Pete’s were Mitsubishi F1M2 launched from the Imperial Japanese Navy sea plane tender “Sanuki Maru”, that covered the landings of the Kawaguchi Detachment’s 35th Infantry Brigade HQ and the 124th Infantry Regiment in Cebu. SANUKI MARU was with the light cruiser KUMA, Destroyers’ SAMIDARE, MURASAME and KIJI, the gun boat BUSHO MARU and two sub-chasers. The Pete’s mission was to destroy the American air force base in Del Monte fields before their bombers can wreak havoc on the Japanese shipping and their invasion of Cebu. At the satellite fighter strip at Dalirig, eight miles south of Del Monte field, Gus Williams and John Brownewell (17th Pursuit) took off on the morning of April 13th for a strafing mission of Davao. Then they spotted two Pete’s over the area and in a dogfight Brownewell shot one down, but Williams’ “P-40 Something” went into wild gyrations in climbing, then its engine quit. Williams managed to get his malfunctioning ship down safely, however. Clockwise: (1) A Japanese “Pete”. The Mitsubishi F1M2 is a two seater Bi-plane manned by a pilot and a rear gunner. It is a multi-role aircraft that is used by the Japanese as an observation plane, bomber, and fighter. (2) The last functioning P-40 on that day was used by Lt. Brownewell to shoot down one of the four “Pete”. It was refueled and armed when Lt. Burns took off, only to crash upon take off killing Lt. Burns. (3) The Del monte Airfield with 2 transport planes. (4) American soldier checking out the wreckage of the Japanese plane that was shot down by Lt. Brownewell over Dalirig. About 12:35, a report came in from an observer post that the bothersome Japanese float planes were again approaching the area and that the one P-40 on the field at the time (a P-40E, perhaps Brownewell’s on his return from the Davao mission?) should be used to intercept. As the alert officer had gone for lunch five minutes earlier, Burns was left to take the mission. In his take-off roll, he failed to hold the ship in the center of the 200-foot wide runway and veered off into large rocks that lined both sides of the strip. The P-40E plunged over the side of the canyon that bordered the field and caught fire. No one could reach him in time and there was no firefighting equipment at the field. Burns burned to death in the cockpit. Unmolested, The Japanese Mitsubishi Pete’s were able to deliver their bomb load and destroyed a B-17E and damaged two others. That evening the chaplain and friends buried him in a little graveyard in a grove of trees. Sadly, he was reportedly on the list of pilots the Royce mission was to evacuate on its return flight to Australia. Lt. John Burns diary’s journey home. According to Rev. Burns, Lt. John Burns’ younger brother the diary was received in a package in 1945 from an American soldier who had been engaged in the seizure of Buna, New Guinea, from the Japanese in early January 1943. The soldier indicated that he had taken the diary off the body of a Japanese soldier killed in the battle. Following his return to the U.S. at the end of the War, the American soldier–whose name is no longer remembered–was able to locate the Burns family to return the diary. The Japanese soldier must have been a member of the 41st Infantry Regiment, which on May 9, 1942, had captured the American air base at Del Monte, Mindanao and its satellite fields, ending the Philippines campaign. The 41st Regiment was subsequently assigned to the New Guinea campaign, arriving in July 1942. It fought its last battle in defense of Buna in early January 1943, at which time the Japanese soldier was evidently killed. One wonders how the Japanese soldier came into possession of Burns’ diary and why he was carrying it on his body at the time he was killed. Burns had been killed in an accident taking off from Dalirig strip, Mindanao, on April 13, 1942, and was buried at nearby Del Monte that evening. It is likely the chaplain who buried him–probably Joseph V. LaFleur, the chaplain of the 19th Bomb Group who was at Del Monte at the time–found the diary in Burns’ living quarters and kept it for return to the family as part of his duties. His intention would have been thwarted when he was taken prisoner with the rest of the surrendering American force at Del Monte and turned over the “souvenir” when ordered by the Japanese. The diary provides an invaluable day-by-day account of the activities of Burns from the time of his departure from the U.S. on November 1, 1940 through April 11, 1942, two days before his death. It is the only contemporary source that exists of the initial operations of the 21st Pursuit Squadron and its subsequent experiences on beach defense and at Bataan Field in January, February, and March 1942. Doomed at the Start: American Pursuit Pilots in the Philippines, 1941-1942 (Williams-Ford Texas A&M University Military History Series) is a must read book if one must know about the 21st Pursuit squadron in the Philippines during World War 2. I also used the book Flying Cadets of World War II for additional references.